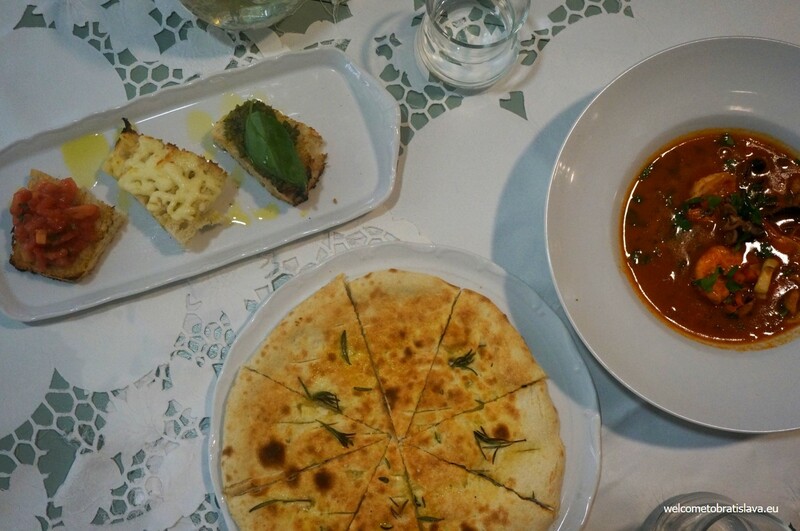 To quote a famous director: “If your mother cooks Italian food, why should you go to a restaurant?” Wise. But for those of us without madri italiane, the trattoria beckons. 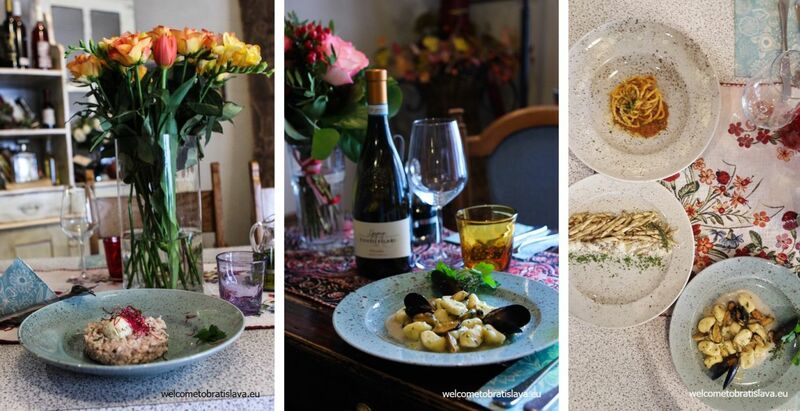 Italian cuisine holds a special place in the hearts – and bellies – of the Welcome to Bratislava team. 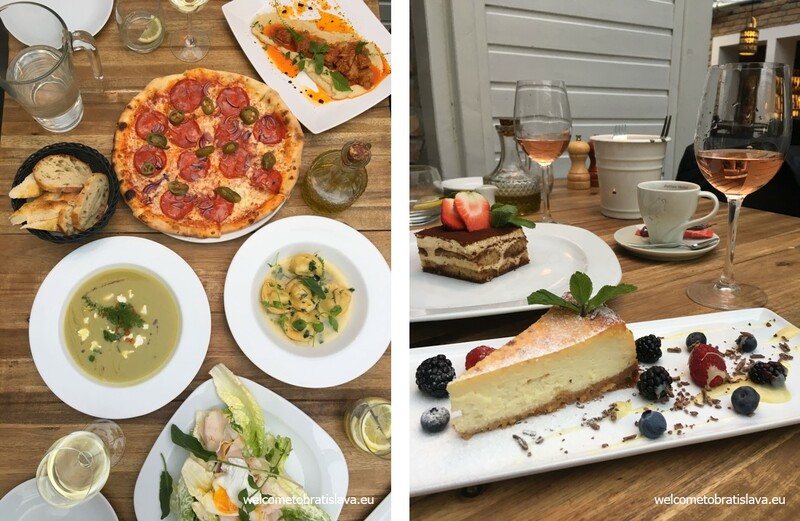 From informal pizzerias specializing in imported ingredients to cafes putting a modern touch on traditional classics to finer dining options specializing in seafood, we have compiled a cross-section of our favorite Italian places in Bratislava. Read on, be inspired, eat Italian. 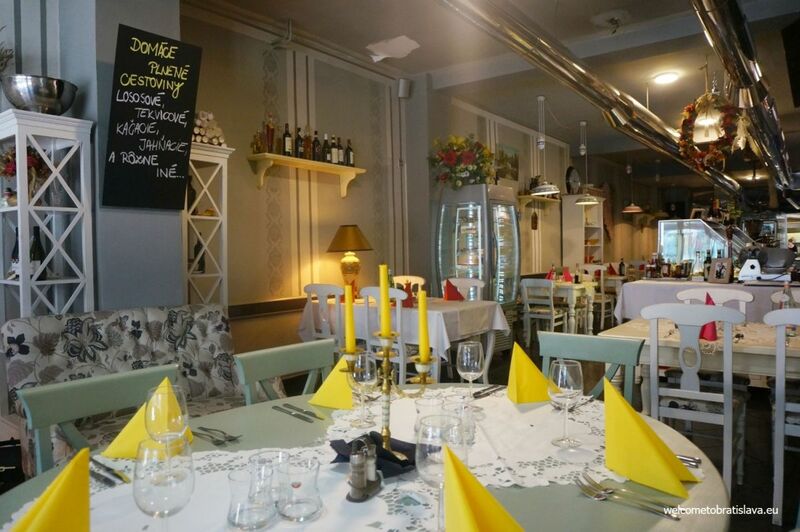 Restaurateurs Mirko and Otello have transformed a family-home into one of Bratislava’s most charming dining experiences. 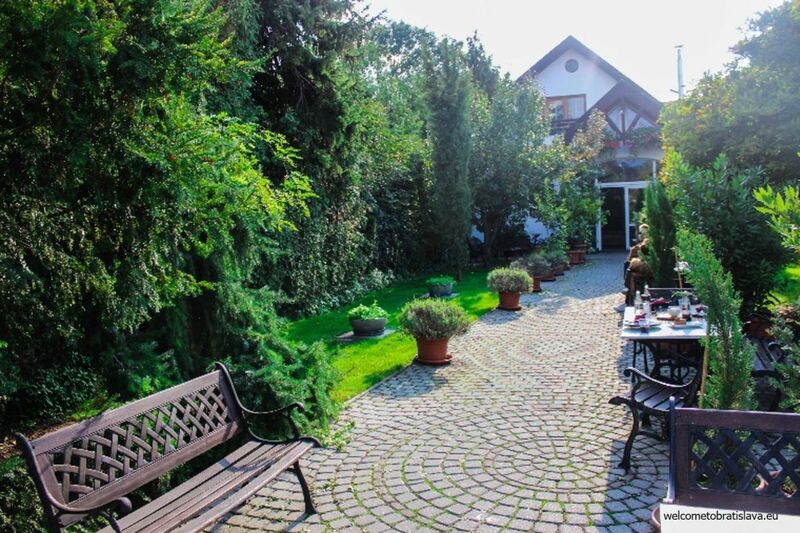 Located just outside the city center in the Rusovce municipality, the restaurant is admittedly farther away than most day-trippers are prone to venture. For locals and adventurous tourists, however, Antica Toscana is a beloved favorite for homestyle cuisine. This restaurant is so popular that not even its distance from Bratislava-proper limits the crowds of regulars who dine here. Some advice: during peak hours don’t bother traveling all the way here without a reservation. The premises are older and slightly ramshackle, which we find utterly charming and loaded with authenticity. Close your eyes and imagine a cut-out of an quaint Italian village scene: This is part of the Antica Toscana image the owner is proud of. 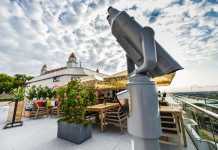 Our tip is to sit on their lovely terrace in the summer, surrounded by the orange and lemon trees growing around you. The surrounding greenery provides you with extra privacy and that vacation-in-Italy vibe. 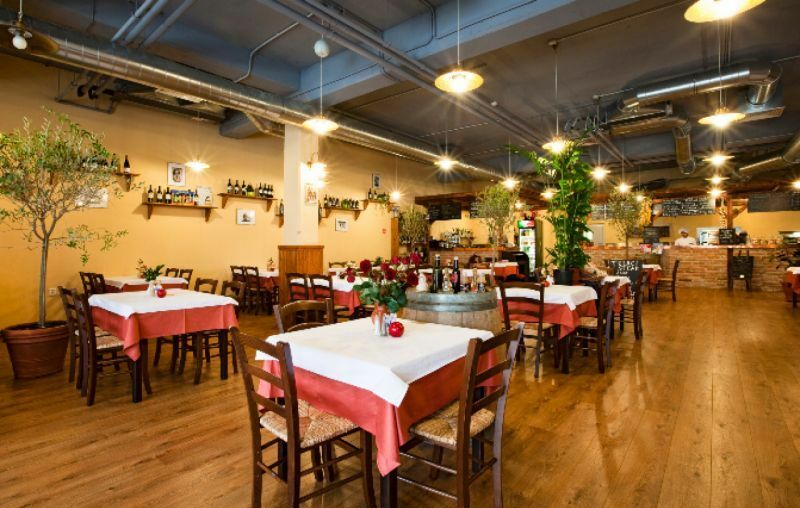 An authentic Tuscana atmosphere, high quality food, and a lively vibe thanks in part to the friendly personnel bursting with Italian cordiality are the key reasons Antica Toscana is so loved by Bratislava locals. The half Italian, half Slovak owner built his business on offering genuine Tuscan ingredients produced by the small local businesses, bringing the recipes of his Italian grandma to his guests, and ensuring a homey, friendly atmosphere. This place is ideal for family gatherings or long weekend lunches with friends. We especially love it here for the many pasta options, the best of which are home-made pasta. The well-balanced pasta sauces and big portions are the reason why you should not miss out this place! A top-pick among locals and tourists alike, Gatto Matto is really a three-concept establishment: the flagship restaurant in the Old Town (perfect for friends, couples, and out-of-towners); the trattoria just outside the centre in Rusovce (best for families with children); and soon to opened bistro/wine club (we predict ideal quick meals or for drinks as a next-stop after dining in the restaurant.) The chain has been going for over a decade and, despite being owned and operated by Slovaks, is ranked among top Italian restaurants in town. This is possible because the team behind Gatto Matto have a passion for Italian dining that can be seen in the quality of the food and service they offer. We encourage you to try all of their stores, but we will focus here on the Old Town location on Panská Street. 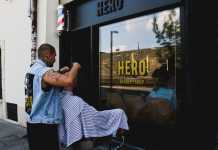 The young, professional team maintains a friendly, hip vibe while offering upscale service in a stylized environment. And while the atmosphere is welcoming and stylish, nothing about it screams “Italian.” That’s okay. During the warmer months the airy dining areas and small patio fill with happy diners who are there for the modern Italian kitchen, amble wine pours and charming servers. Everything we have eaten here is amazingly delicious. This last visit we opted for their fusion-style seasonal menu, a “board offer” which changes every 1-2 weeks: asparagus soup with goat cheese; salad with turkey breasts and poached egg; pizza with salami, jalapenos and honey; homemade tortellini with asparagus and ricotta (they have their own pasta “factory” in the Rusovce branch – as homemade as it gets); and meat ragu with parsnips puree. It was divine spring eating. Desserts here are like heaven, too, the favorite being the homemade cheesecake with thick caramel and berries. We also liked their tiramisu. While the core menu is Italian, the chefs are bold enough to incorporate a very modern sensibility into their creations and we appreciate the outcome. This isn’t haute cuisine, but it takes just enough risks to keep it lively. As you may suspect, for dinners it is better to make a reservation. The daily lunch menu runs from 11:00 to 14:00 and during this time you can only choose from a limited menu to ensure smooth service – it is entirely possible that you will wait in a queue, although the line moves quickly enough. On the plus side, the entire family can join in the experience. Really! This is a dog friendly place, just be sure let them know in advance so they can accommodate. Quoted on Don Saro’s website is the adoring account of Johann von Goethe: “Sicily is the key to everything. The harmonic match of heaven with the sea and the sea with the soil,” he persuades, and those “who once saw it, will remember it for life.” Sicilian-Slovak owners – and a lovely couple – Rosario and Romana have created a living version of the these words in the the form of their charming, small family restaurant in Rača. 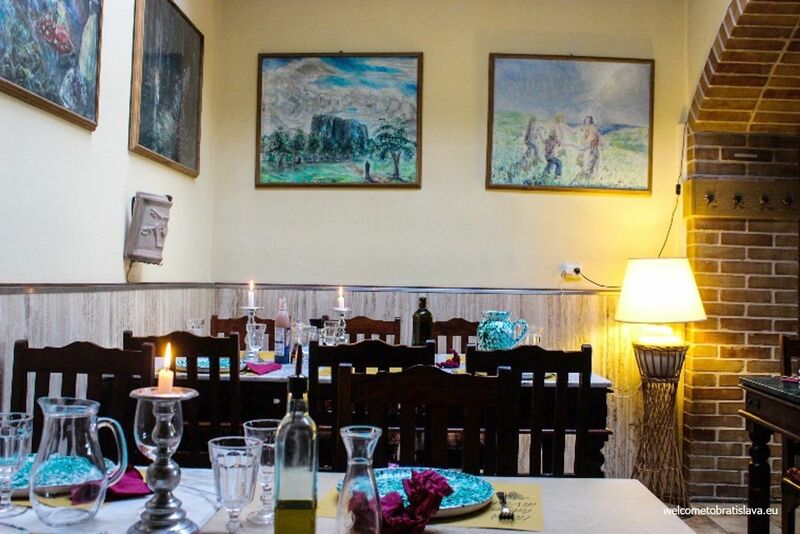 While dining here means leaving the city center, this is the only traditional Sicilian restaurant in town with such authentic character and lovingly presented cuisine. We assure you, it’s worth traveling for. Because the dishes are very fresh and on the lighter side, sampling multiple specialties during your stay is completely possible. In fact, we endorse ordering several courses and enjoying a family-style meal. We started with the caponata, a regional sweet & sour starter of eggplant, capers, and raisins. We devoured it, savoring heaping scoops on their excellent focaccia flat-bread. Both the oregano and picant versions of the focaccia are delicious and the fine, hand-tossed thinness of the dough makes a lovely vehicle for saucier dishes. More eggplant in the form of parmigiana came next. We confirm this as one of the best things in the world! The pasta alla norma was another stand-out. Made with mussels and nero di sepia – pasta stained black with the ink of cuttlefish – the flavor is intense in a pleasantly briny, oceanic way. The pasta used at Don Saro is sourced by a Sardinian chef now living in Bratislava who imports only Italian ingredients to create his products and acts as their main provider. The quality and authenticity are noticable. Slightly full at this point, we still made room for the savory arancino with ragu and cheese – a very traditional Sicilian dish and one we had to try! They are adorable and a must when you visit here. And as always dessert was on our radar – the traditional Cassata Siciliana (a sugar bomb made with marzipan and pistachio) and the slightly less sugary cannoli filled with ricotta rounded out the meal. For little ones with less adventurous palettes, it is possible to request pizza made from their homemade focaccia. And for grown-ups needing a pizza fix the weekday lunch menu offers pizza, too. But we highly recommend immersing the Sicilian experience with a crisp, aromatic glass of regional wine while the Italian music and sea-toned blues that adorn the dining room prepare you for one of the best Italian meals this city has to offer. Like with all the best restaurants, reservations are a must. This is especially true on Fridays and Saturdays when the kitchen prepares unique specials and regulars flock in to try out the new dishes. Italian restaurateur and chef Roberta opened this local favorite in 2012 and has steadily built a reputation of providing one of the best Italian dining experiences in the city. Technically a ristorantino, due to its petite size and cozy atmosphere, Mille Baci is an uniquely hospitable eatery with a huge focus on treating guests like extended family. This works so well, in part, because the establishment is proudly owned and operated by actual family. Since their move to Slovakia from the Veneto region of Italy, this restaurant clan has emphasized hospitality, familiarity, and a sense of the Italian home in each of their ventures. We absolutely felt that devotion and homestyle quality during our visit. Starting with the interior, the family has created an almost second-living room that ensures guests arrive to an extension of their home rather than a stuffy dining area. The rustic country-style decor and intricate details – think stacks of Italian newspapers, flowers wedged into Italian wine bottles, heirloom-esque furnishings – complete the motif. Add to this the beautiful serviceware, glasses, and linens (brought here from Italy, naturally), plus a little serenading from piped-in Italian love songs, and the stage is set. Of course, the kitchen is what ultimately defines a terrific restaurant and at Mille Baci they take great care with their menu. 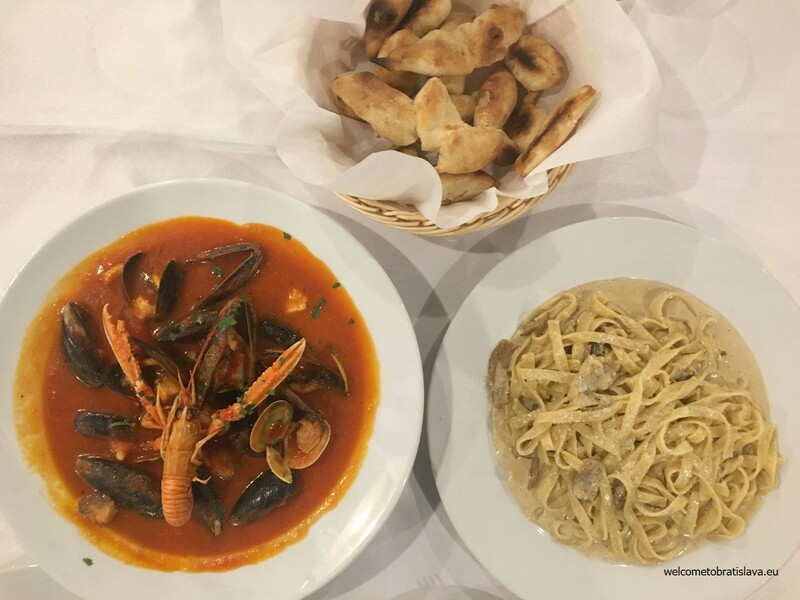 The fresh ingredients are excellent and many items are imported from trusted sources from the Veneto region, the cuisine of which defines the selection here. Even the wine list reflects a bit of Venice, making sure to represent Tre Venezie classics like Prosecco and Valpolicella. Local Slovak wine is featured, too; the excellent Blanc Andre cuveé from Miloš Máťuš’s vineyard in Rača is a welcome addition. Cuisine-wise, the aim is to always deliver a new experience to the guest. The menu is never the same, even the daily lunch menus have almost never repeated since opening. This is admirable considering the majority of dinner options are served à la carte and change monthly to accommodate for seasonal availability. You can count on variations of your favorites, however; Italian (creamy) risottos, pasta “bigoli” and gnocchi made in-house, and tagliata – Italian sliced steak – will always grace the menu in some form. We love everything here and highly recommend this for date-night or a special occasion – like really craving a dish of perfect bigoli ragout and a bottle of full bodied Rosso di Montalcino. Cheers to you! Of note, be ready to pay the tableware charge that is automatically included in the bill. 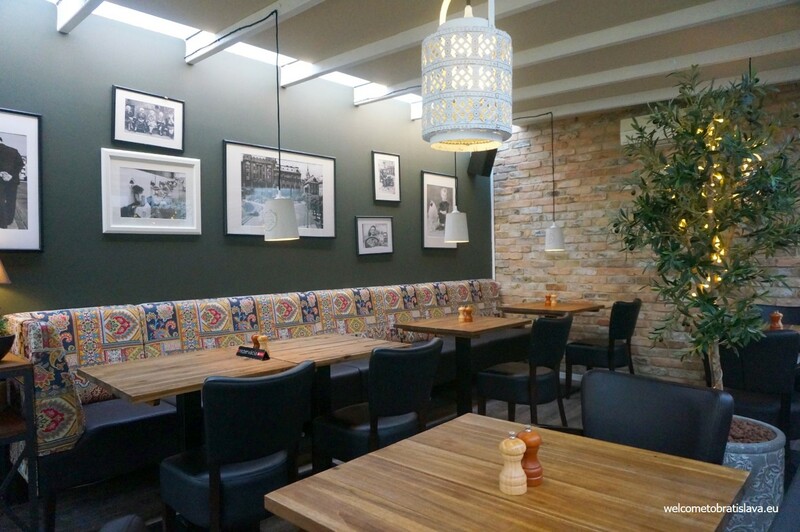 Designed to remind you of familiar regions across Italy, the vibe of Da Cono’s three locations in Bratislava is homey and cosy and the cuisine is, of course, classic Italian. 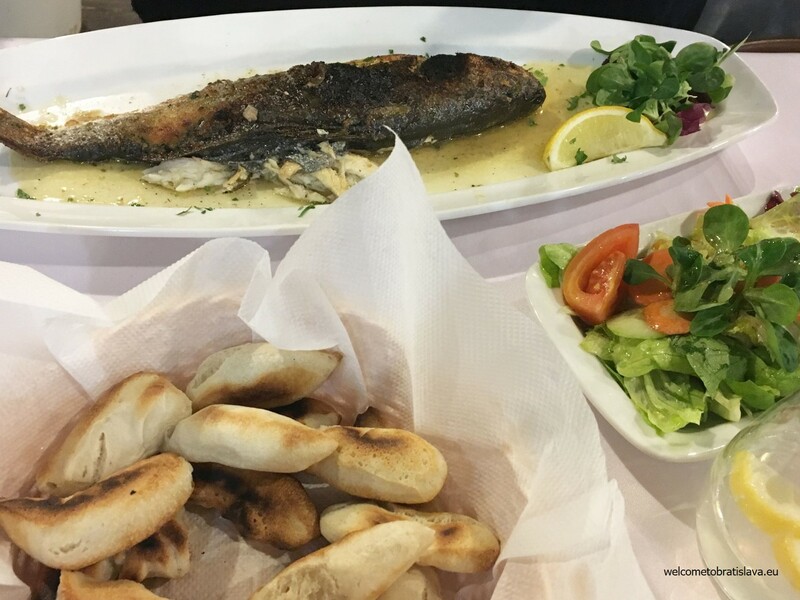 The menu consists of everything you would expect – snacks, antipasti, salads, soups, pasta, pizza, meat, fish, and desserts. But the real standouts are their pasta and dolce, the sweets selection. We can’t eat enough of it here! Especially their panna cotta, which is almost worth the trip alone. If Da Cono has one little downside – and we do mean little – it’s the fish. In terms of dishes we crave enough to return specifically for, much of the seafood here doesn’t make the list. That being said, we suspect our experience may be chalked up to a bad day in the kitchen because we have an insider’s tip on an off-menu dish that blew us away: Their special fish soup is a dish you can ask for á la cart and we highly recommend it if you have the time. Because the soup is made to order, the preparation time is longer than normal, but worth the wait. Speaking of which, when it gets busy the service is a bit slower and you might need to wave to get noticed. In addition to a good meal and tasty wine, you will also find a small shop with Italian products here. For us this is another great excuse to visit. The range of products is wide, from pasta of various kinds to seasonal olive oils and sauces to wines from different regions of Italy. It should be mentioned the dishes here are slightly more expensive than average, but you are paying for the high quality of fresh ingredients and a skilled kitchen. The portions, however, are really big and you won’t leave hungry. 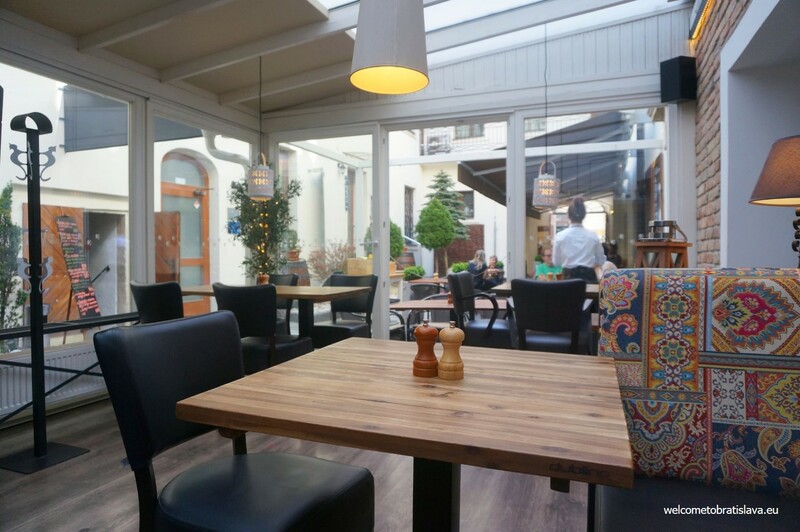 Touted by many locals as the best pizza in Bratislava, Basilicò is a newer addition the the city’s Italian food scene. Look past the basic interior and less than romantic location on a busy intersection near Twin City – dinner here is a complete treat. 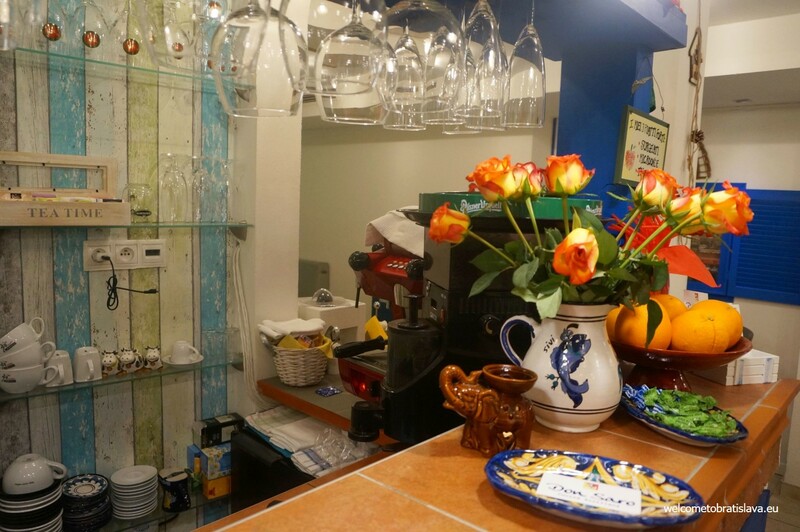 In fact, the trattoria-style ambiance with its memorabilia laden walls and plain seating is the perfect juxtaposition to the utterly authentic and high quality Campanian cuisine. Besides the pizza for which they are mostly known (more on that later), the menu offers traditional antipasti and generous platters of Italian cured meat and cheese. For something more substantial, try the melanzane alla parmigiana – their version of eggplant parmesan – or the hefty lasagne smothered in housemade ragu. And of course it would be worth sampling some of their sweets. Read: cannoli! We came here for the pizza, though, and boy does it live up to the hype. The secret to its success is the base. Made in-house and left to leaven for 48 hours, the resulting dough is thin yet sturdy with a chewy crust that bubbles perfectly under the flames of their traditional pizza oven. Being Napoli-style pizza, San Marzano tomatoes and fresh mozzarella complete the dish. 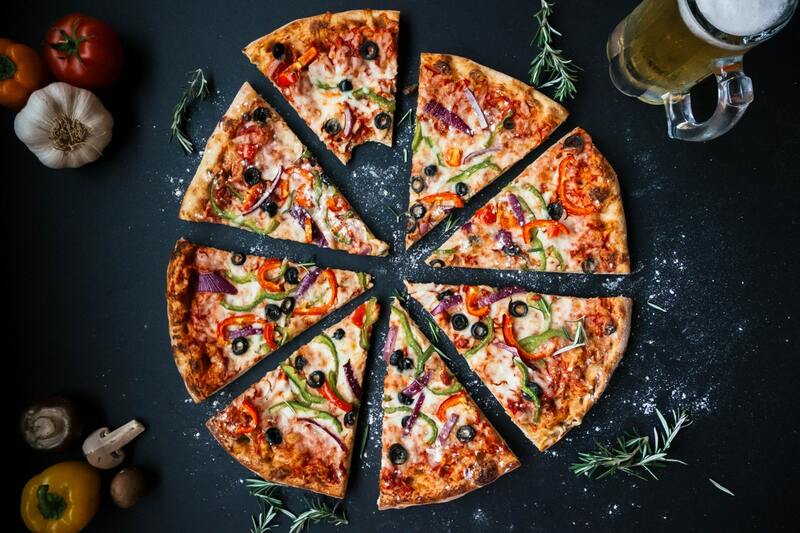 You can stick with the classic and leave satisfied, but do try one of their many varieties such as the Porcini Speck or the Margherita con Bufala for incredibly decadent eating. Whatever you choose, you’ll enjoy comforting food served by a very friendly team who seem truly happy to be part of your Italian experience. We have to add that Basilicò is on the smaller side and the dining room gets packed. Reservations are highly recommended. During weekday lunches this is especially true, as a rotating menu is offered that draws hungry office workers from the surrounding businesses. Plan ahead! 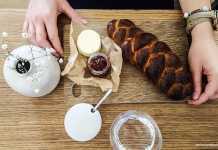 A full day of shopping and sightseeing is always made better by a midday dessert break or a light wine-paired supper in a delightful environment. 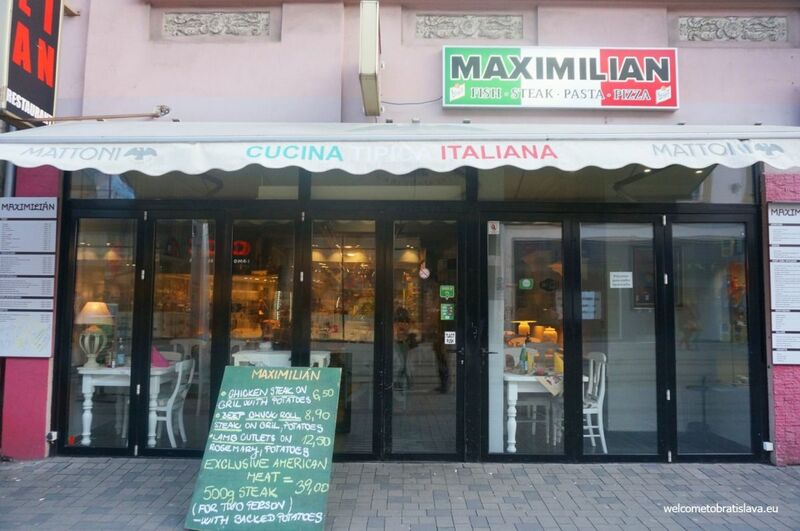 Nestled along the shop-lined Obchodná Street, Maximilian is beautifully decorated restaurant in the perfect location to stop for a while and enjoy the ambiance while doing a bit of people watching. The focus here is fish and seafood. In fact, the owner travels all over Italy for inspiration and for the past five years has worked with his Sicilian chef to create a menu that represents all the regions of Italy. And yes, this means the basics like pizza, pasta, and steak are offered here, the quality of which is the cause of extremely polarized opinions from locals. The obligatory obedové menu is also offered – the week-day lunch menu found in most eateries in the city – with the slightly higher than standard price range of 6,50-10 €. 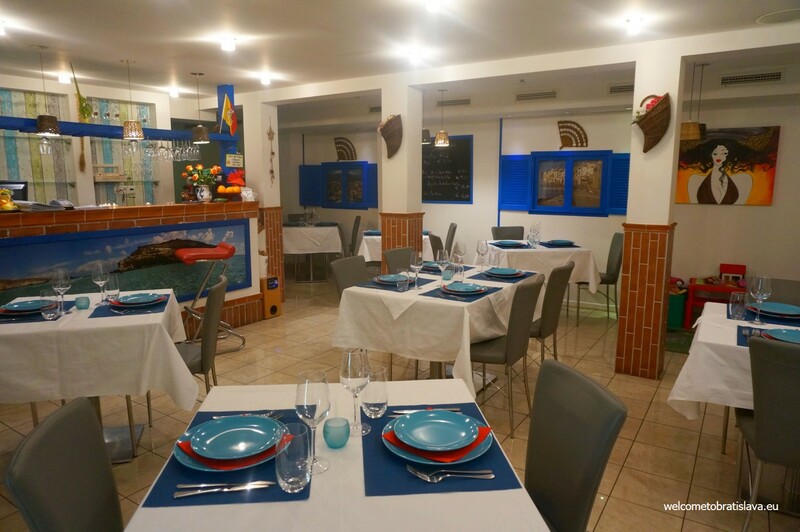 But we advise against ordering the basics here and focusing on the fresh seafood and romantic, intimate atmosphere. The fish soup, for example, is briny and fresh – especially enjoyable with delicate bruschettas that manage that perfect ratio of crusty toasted exterior to springy soft center. 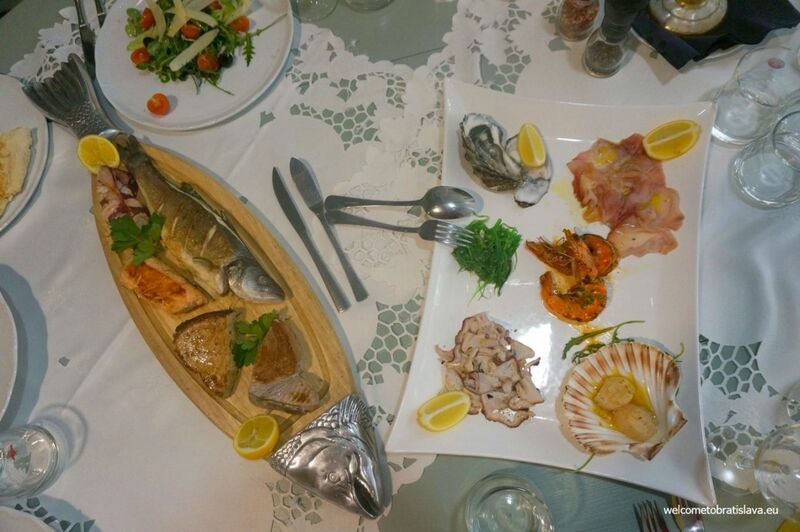 The fish platter, too, impressed us with its selection and presentation. If dessert and coffee is your desire, the homemade tiramisu is a must. It is the only dessert they specialize in, the rest being sourced from other bakeries, and a real treat. A few things to be aware of: Currently the only payment method accepted is cash. And expense-wise, do expect to pay tourist level prices – water is 1,50 € per person. Visit Maximilian for the romance, location, and specialties; you will enjoy yourself much more. This list is not ultimate and we are still on a radar for more to be added – your suggestions are welcome, too!